The Hero PR did not have a round barrel if I remember correctly? At one stage I had all the info and had drawn blueprints on the dimensions and shape, but it seems a harddrive crash a few years back cost me that data and I gave up on it. I had planned to build one and share the info with the board - Thinking we could get someone to do a run. I remember the barrel was wider, which would require a custom triangular barrel support. I remember there were discussions about the barrel potentially being some sort of industrial valve and someone else had taken direct measurements from the 1:1 scale black and white Bapty photos, but I cannot find them now?!? Anyone else have info on this?? Last edited by treeboar on Wed Dec 24, 2014 1:51 am, edited 1 time in total. 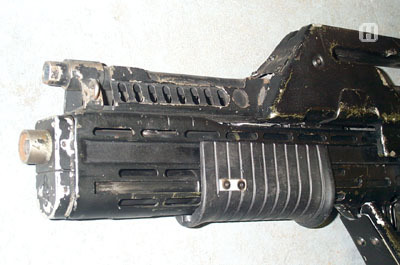 "Aliens - Pulse Rifle Grips and Barrel Extension: A grip and barrel extension section of a Pulse rifle used on James Camerons sci-fi classic Aliens. The grip is made from resin with a small metal plate on the left side. 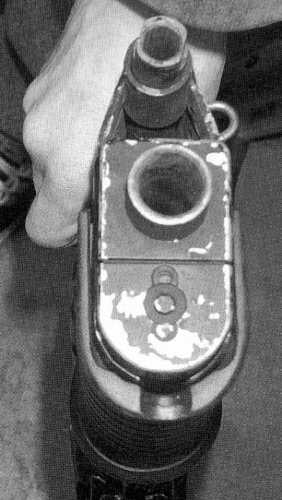 The barrel extension was used as a restrictor for the Thompson section of the rifle and to also extended its barrel to bring it inline with the front of the rifle. The grip measures 13cm (5") and the barrel extension measures 8cm (3"). £495.00 / $839.00"
The Prop Store definitely had some front-on shots of the barrel. Do you have those - Lost all mine in the harddrive crash!!! Those are the only shots that I saved so I'm pretty sure that was all that were posted, but I didn't search that thoroughly. I'll check again when I can. I gotta say this is all new to me, but its handy info considering I was just mulling how to tackle the barrel on my latest pulse build. I was considering extending the air-soft Thompson instead of replacing it. I was worried about a "seem" and now i am far less concerned with that, as it appears screen accurate. Definitely something to think about. But it doesnt really jive with the bapty photo of the pulse construction that has been circulating. That seemed to be clearly made from a thompson with the factory extended barrel? No? A clever weld and blend job? Or is this a case of multiple Thompson's each being built a little different from each other? 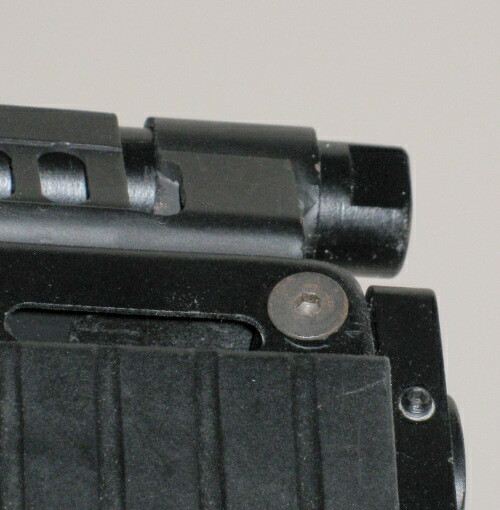 Perhaps there were not enough factory extended barrels to go around so some got the screw on extension? This was driving me nuts but I found what I was after... so allow me to share. Firstly PHOTO CREDITS out to Jon and Stefan!! "The outline you see is a CAD-Model of an actual, unmodified M1A1 barrel (with the barrel adapter attached) with dimensions taken from the real deal and cross checked with blueprints of the Thompson. As you can see - it matches perfectly to the picture of the photo. So unless they (Bapty) modified the whole length of the Thompson barrel (which I find unlikely) the front diameter is 0.75"/19.05mm. I guess the problem arises from the perspective that's in the picture. 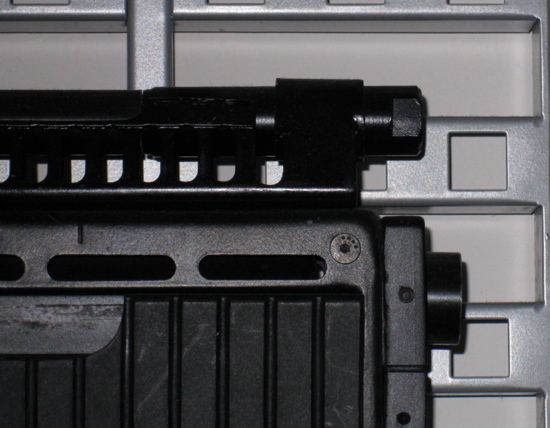 The side wall of the SPAS cage is slightly near to the camera than the barrel. So when the side wall in the picture matches perfectly to the real deal, the barrel will show up slightly smaller in the picture. You can see the effect at the slots of the SPAS cage too - if it would be a true isometric picture the slots of the rear wall would align perfectly with the front slots. " Well damn. Learn something knew every day. Cool. Hope you do not mind me hotlinking your pictures here, but you have some decent images on your site of this barrell too. I knew I had not imagined it. Stefan's Barrel cage is built from 3mm thick steel, which started life as 40mm x 40mm steel box section tubing (which unlike aluminium squared tubing is slight rounded, not truly square). This is then machined, before having two sides bent in towards each other to form the triangle. 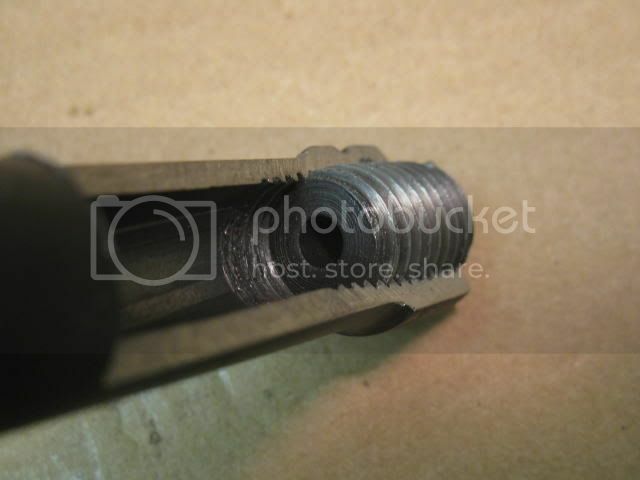 As he notes the bend inwards does not start in the corners of the square tubing, it actually starts further up, where the Barrel cage has been machined, at the bottom of the milled slots (the weakest point). If you look at the original vents you can see the same effect. His assessment was that bending the part is actually quite easy for the front part. Just a vice needed to clamp down the bottom to keep it straight. This is especially important for the rear part as the material is not weakened by the cutouts. Luckily, you don't need to bend it much there due to the taper of the barrel. Nevertheless, he had to heat that area with a blowtorch to get it done. So... Bugstomper... Firstly a million thanks and secondly... can you confirm all of the above? Where any modifications/changes missed? How far did you get with the 8-holer? I just got back from my X-mas holidays - so I'm a little late to answer your questions. However, it looks like you did a great job with the search engine. The dimensions for the barrel extension are indeed the latest version. Btw. 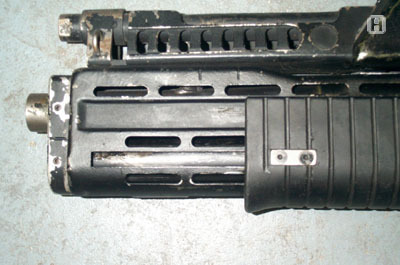 : Where did you find that picture of the cut open barrel with the blank firing adapter? Did it come with any additional info? The cut away image is of a Thompson barrel with blank adapter added - exactly what we are discussing! It's interesting that the oriface diameter (4.75mm) of the blank firing adapter is quite a bit smaller than on the PR (7mm). So in Aliens they were probably using even "hotter" loads than then standard .45 blanks. Would a hotter load produce a brighter muzzle flash? If so then it's pretty safe to bet they went as hot as they could get. Yeah bigbisont, bigger flashes! AND bigger bangs!